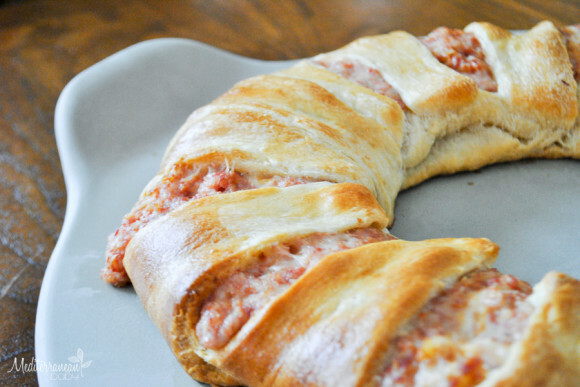 I must be into the whole crescent roll/appetizer deal right now, as I have offered two of these recipes in a row. Trust me, this one is delicious, too, and makes the perfect holiday appetizer. This has been my Thea Connie’s go-to app for years and now she’s sharing it with all of us! FYI, be sure to have another batch on hand as this goes quickly and everyone is usually clamoring for another round. Again, I used my new Stack and Snap 10 Cup Food Processor from Hamilton Beach to mix all of the ingredients. (Don’t forget, you still have until December 4th at 11:59 p.m. to enter to win one for yourself! Click here for details!) I also used my Pampered Chef stone for this one as I like a little bit of crunch with this recipe and the evenness of the baking on the stone. Using a food processor, combine first four ingredients by pulsing them together to chop and combine, but not puree. 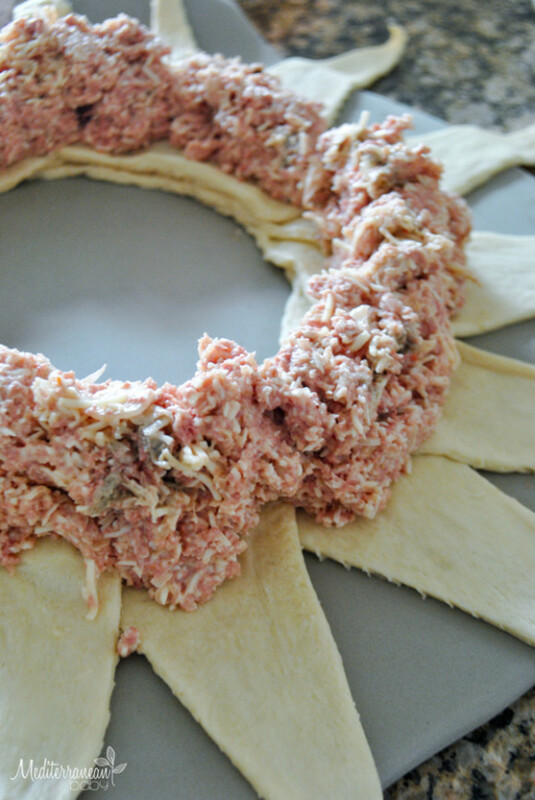 Arrange crescent roll dough in triangles, forming a circle, with the widest ends of the triangles in the center. You are forming a circle in the center of the platter with the triangle tips all pointed toward the edges. Fill the reuben stuffing about 1 1/2 inches from the center of the ring. Roll the triangles toward the center and tuck under the edges to form a wreath. Bake for 25-30 minutes until golden brown and bubbling on the edges.